We resume our journey along the Ganges. 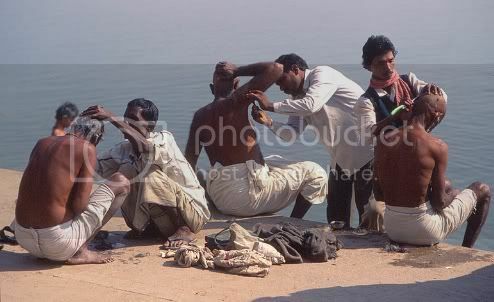 Those who have not read the previous parts of the Voices along the Ganges series, please read my earlier posts Voices along the Ganges : Saints & Beggars, Voices along the Ganges : Chants & Folklores and Voices along the Ganges : Weddings & Funerals. 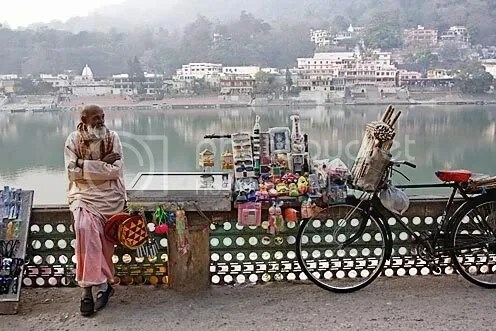 The river Ganges which originates in the Gangotri glacier in the snow clad Himalayas, descends down the mountains, reaches the plains at Haridwar, flows through ancient pilgrimage sites such as Prayag (Allahabad), Benares and Patna, and drains into the Bay of Bengal. Sagar Island, at the mouth of the river Hooghly in Bengal, where the Ganga breaks up into hundreds of streams, and drains into the sea, is honored as a pilgrimage site, signifying the spot where the ashes of the ancestors of Bhagiratha were purified by the waters of the Ganga. An important festival of Bengal is Kali Puja, a festival in which people worship Goddess Kali, the goddess of destruction, the saviour of mankind from evil demons. During this Puja, clay images of demons are sold to be placed alongside images of Kali herself. At the end of festivals, thousands of devotees converge on the Ghats of Kolkata to immerse clay images of Durga, Kali, Lakshmi and Saraswati into the river. 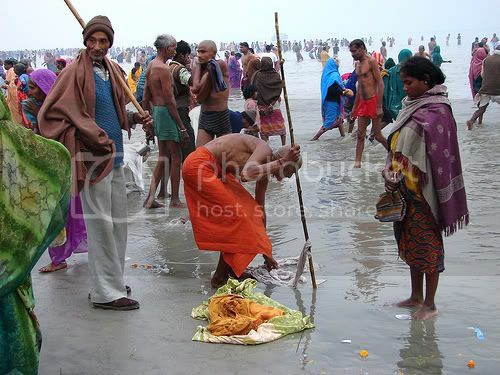 Every year, in mid-January, a religious festival, Gangasagar Mela is celebrated at Sagardwip, the last island before the ocean, where the Ganga meets the sea. A dip in the ocean, where the Ganges drains into the sea is considered to be of great religious significance particularly on the Makar Sankranti day (mid-January) when the sun makes a transition to Capricorn from Saggitarius and this town becomes home to vast fairs, drawing visitors and recluses (sanyasis) from all over India. 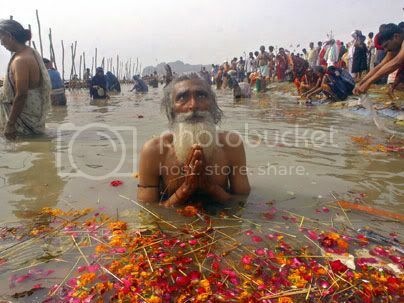 As I write this post, news has already poured in : River Ganges has been declared the National River of India. Prime Minister of India, Manmohan Singh later announced : ‘the emotional link between Ganga and Indians needs to be recognised‘. 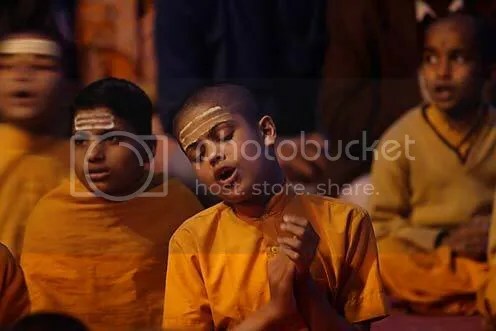 In my earlier posts Voices along the Ganges : Saints & Beggars and Voices along the Ganges : Chants & Folklores, I let you experience some great exotic sounds right from the source of the Ganges, Gomukh to Benares (Varanasi) and then Patna in Bihar. Bihar has immensely contributed to the hindustani classical music and has produced musicians like Bharat Ratna Bismillah Khan and dhrupad singers like the Malliks (Darbhanga Gharana) (see previous post on the Malliks) and the Mishras (Bettiah Gharana). Bihar has a very old tradition of beautiful folk songs, sung during important family occasions, such as marriage, birth ceremonies, festivals, etc. They are sung mainly in group settings with the help of many musical instruments like Dholak, Bansuri and occasionally Tabla and Harmonium are used. Bihar also has a tradition of lively Holi songs known as ‘Phagua‘, filled with fun rhythms. During the 19th century, when the condition of Bihar worsened under the British misrule, many Biharis had to migrate as indentured laborers to West Indian islands, Fiji, and Mauritius. During this time many sad plays and songs called biraha became very popular, in the Bhojpur area. Dramas on that theme continue to be popular in the theaters of Patna. Continuing our journey southwards along the bank of the Ganges we come across Mithila, a land shaded by old mango groves and watered by melt water rivers of Nepal and the Himalayas. The men of Mithila have been famous as priests and scholars. The women largely illiterate, find cultural expression through exquisite paintings created for ritual occasions. They cover their courtyard walls in abstract images in brilliant colour. In the 1960s some local officials realised that if the women would only put some of their paintings on paper there might be a worldwide market for their creations. 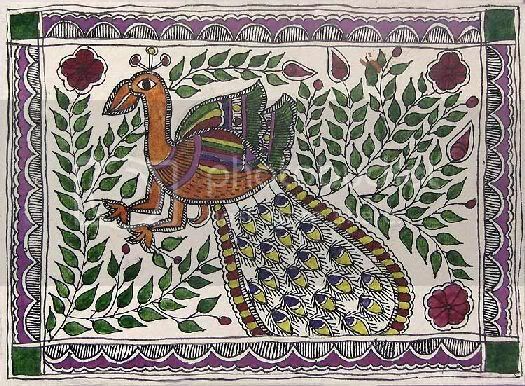 They proved to be correct and it is a mild irony in Mithila that the fame of the women has surpassed that of the men, because Mithila Art, otherwise known as Madhubani Paintings also, is now recognised throughout the world. Before commencing any further, a small ‘statutory‘ warning. Please do not blame me if you find the links to the mp3 files in my posts to be dead, sooner or later. I do not know of a site that has hosted it’s music files for more than a few years. The web is abundant with dead mp3 links. Already many of the songs that I had put in my previous posts have been removed by their host servers, and visitors on my blog have been sending me frantic complaints. Amusingly mp3 files are like orphan kids, living on the streets, forever yearning for a permanent abode. They are more often than not, shunned after a few days of shelter offered by a kind soul. Ironically mp3 files are the most sought after but also the most hounded after files, always being chased by copyright laws. At first loved, then hated and feared by the webmasters, mp3 files are almost treated like live bombs amidst peace loving net-citizens. So don’t be surprised, if you wake up one fine morning and find the links not working anymore and the files gone forever. 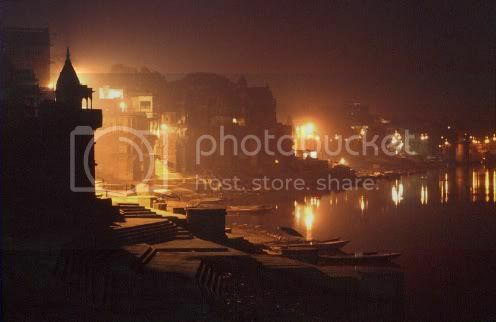 Continuing our journey along the holy river of Ganges, we arrive at Benares (Varanasi), the holiest city of the Hindus. The significance of Benares lies not only in the fact that it is considered so holy, but in the fact that it embodies the Hindu philosophy of death. Death for the Hindus is just one step forward in the endless cycle of birth and rebirth. 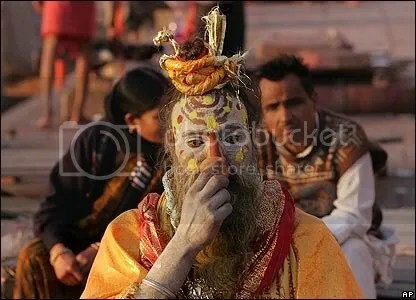 And believers come to Benares to die or to cremate their departed relatives, believing that Lord Shiva himself whispers words of salvation into the ears of the dead here. These words of salvation, Hindus believe, free their souls from the cycle of birth and rebirth, granting them moksha. Nowhere else do death and life coexist so closely as they do in Benares. Boatmen row, beggars beg, bathers bathe, and pilgrims pray. 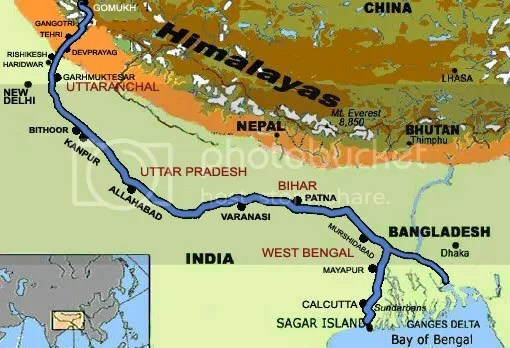 The largest tributary to the Ganges is the Ghaghara, which meets it before Patna, in Bihar, bearing much of the Himalayan glacier melt from Northern Nepal. The Gandak, which comes from near Kathmandu, is another big Himalayan tributary. Other important rivers that merge with the Ganges are the Son, the Gomti which flows past Lucknow, and the Chambal made notorious by the ravines in its valley which are noted for lawlessness and banditry (including the infamous Phoolan Devi). Twenty centuries ago, the essential role of music of India was deemed to be purely ritualistic. Much part of Indian music is folk music. Indian classical music is said to have evolved out of the fusion of these. It is presumed that folk music existed long before the Aryans in India. Indian classical music has become unique in the world. Hindustani music is an enveloping influence in Indian life. It pervades the big and small events of Indian life, from the birth of the child to it’s death, religious rites and seasonal festivals. Originally, not all developments of music were transformed to writing. To keep their traditional integrity, they were imparted orally from master to pupil : the Guru Shishya tradition in gurukul. Winding 2,510 km across northern India, from the Himalaya Mountains to the Indian Ocean, the Ganges river is NOT just a flowing body of H2O (water), but a whole culture and way of life to India. Innumerable stories, plays, songs, movies, history is woven along the wild journey of this mighty river. From the small but wild Himalayan birth to the mighty, fast paced or silent journey into the fertile Indo Gangetic Plain, and cities of Allahabad, Benaras, Patna and Kolkata, the Ganga is a major contributor to the political history and spiritual culture of this subcontinent. ‘Voices along the Ganges‘ is an effort to take the listener on an odyssey down the river Ganges, from Gangotri to Kolkata. The rich music, a fusion of various instruments, permeates the senses infiltrating them with a soulful confluence. The compositions have been beautifully woven around a meditative pattern ranging from soft to rhythmic and highly energetic. We will travel further south and savour more of the Ganges ‘flavour‘ in my future posts.